It is legal to allow Good News Club® to meet in school facilities. 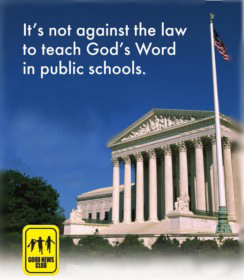 On June 11, 2001, the U. S. Supreme Court ruled that Child Evangelism Fellowship® could have access to public school facilities to conduct Good News Clubs. The decision stated that Bible clubs such as the Good News Club must be given the same access to school facilities accorded any other non-school-related outside group. Free speech rights had been violated because of our religious viewpoint. Restrictions must not discriminate against speech based on viewpoint. Permitting Good News Club to meet on school premises does not violate the Establishment clause. The danger that children would believe the school to be endorsing religion is no greater than the danger that they would perceive hostility towards religion if the club were excluded from this public forum. In 2014 almost 184,000 school children attended an after-school Good News Club conducted in over 3,500 public schools.